In Shanxi Province there are essentially three main gates of the Outer Layer of the Great Wall of China plus various minor gates of the inner layers of defensive walls in the Region. Starting in the East, the Main Gates in Shanxi Province are Yanmen Guan, Ningwu Guan and last of all, located in the West near the Yellow River (Huang He), Pian Guan. Because it is historically part of the Inner Layers, PingXing Guan, the most Northernly Great Wall pass in Noth-East Shanxi is not counted. It is west of PingXin Guan that the Outer and Inner Layers of the Great Wall fuse together at Baiyang Mountain, making Yanmen Guan south of Datong the First Gate of the Outer Layer of The Great Wall of China in Shanxi Province. All three main gates fell under the jurisdiction of the Pianguan Pass and its Garrison patrolled as far East as Baiyang Mountain, the point of juncture of the Inner and Outer layers of the Great Wall. Among the Inner layer Passes and Gates are four main sites: PingXing Guan outside Hunyuan, Longquan (Guan) on the Shanxi-Hebei border south-west of Hunyuan (and the Monastery-in-Mid-Air) and due East of Xiao Wu Tai Shan Mountain, Ningzhou Pass on the railway line North between Taiyuan and Xinzhou and Niangzhi Guan and Yangquan, which block off the pass between Taiyuan in Shanxi Province and Shijiazhuang in Hebei Province. 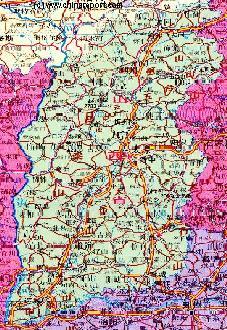 Ping Xing Guan Great Wall location coordinates: 39°19'0" North 113°54'0" East. The Pingxing Guan (Chinese: 平型关), is the "Flat Shaped Pass". Pingxing means of flat shape and Guan means pass. As mentioned above, the Pingxing Guan Pass is located due North of Huanyuan, a village more famous for its Hanging Monastry (Xuankong Si or Monastry-in-Mid-Air). The actual Pass and its Great Wall are located atop Pingxing Mountain, Pingxingguan Pass occupies a strategically important position between Hengshan Mountain of 2016 Meters reaching visibly to the sky in the north and the Wutai Mountain Range with Yadou Shan of 3058 meters the highest peak to the south. The pass Pingxing Pass itself is nearly one kilometer wide and the road passing up through it has no exit out of the loess walled valley for several kilometres (except for the road itself). The ancient road follows the path of the huluo river and connects the northern part of Hebei Province in the east with Yanmenguan, the next Gate and Pass on the Great Wall in Shanxi Province, south of Datong, in the west. Steep Cliffs tower over a 7 kilometer long road ideal for ambush. Located at Pingxing Guan are the remnants of the Main Pass Gate built during the Ming Dynasty Era (1368 AD - 1644 AD). The entrance gate is a little over thirteen feet high and about nine feet wide. Sadly, the gatetower is in ruins and the entire pass has suffered much erosion over the years. Nearby are remnants of two fortresses that can be visited. The actual site of the Pingxing Battle of 1937 AD is 5 kilometers to the northeast of Pingxingguan in a small village named Guangou Vale in Qiuling County of Shanxi Province. Along the roadway here sits an official Memorial to this Historic chievement of the Communist Troops. Although it should be considered a remote spot, Pingxing Guan is becoming a Tourist Magnet as bus tours on the way to Huanyuan never fail to stop for a look-see. "First Act in China - The Story of the Xian Mutiny"
leader of the Communist Party. In 1964 AD he was Minister of Defense. Lin Biao was the Man behind the composing and the Production of the infamous "Little Red Book" so abused in the Cultural Revolution Era. Lessons learned in this Battle would be put into good practice all over North-China and would become the hallmark of Communist Leadership Strategy in War, resulting eventually, in the Victory of the Chinese Revolution. 1938 AD and left some 30.000 dead. In the spring Months of 1938 AD, the Japanese would penetrate both Pingxing guan, Yanmen Guan Pass and Xinzhou pass, as well as the Yangquan Pass East of Taiyuan and go on to capture Taiyuan. The Battle of Pinxing Pass however did have a lasting effect. 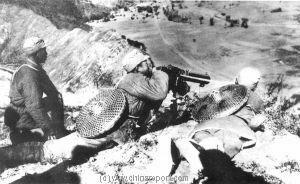 First of all it bogged down the rapid Japanese Advance from Beijing into Northern China. And secondly, by delaying the advance enough, eventually the pingxing guan battle and other local skirmishes like it saved the important City of Xi'an in Shaanxi from falling into Japanese Hands. The City of Xi'an was threatened for a long period, the routes leading to the City as well as its old center were bombed, but Xi'an was spared and remained free and Chinese, under shared control of the Kuomintang and the Communist Party. The village of Yan'an, far to the North of Xi'an in the Ordos Desert would remain the Communist Party Headquarters for quite some time after allowed to develop into the core base of the Entire National Struggle for Communist Revolution. Due to its important symbolic function for Moral at the Time the Pinxing Battle is regarded as one of the key battles of the Sino-Japanese wars and is known as the "Pingxingguan Victory". 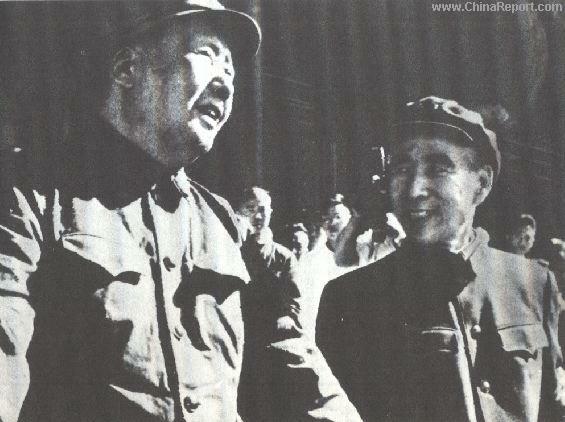 Mao Zedong and General Lin Piao on the Rostrum of the Tian'An Men Gate in Beijing in the 1950's. Pingxing Guan Pass o/t Great Wall depicted on Stamp valued 270 Fen. 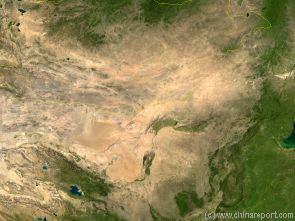 A Full Google Earth Supported Map of PingxingGuan Pass by Google.com. Adjacent Map gives direct access to Pingxing Pass Map by Google Earth.